I love this collection!!! These ornaments are painted on laser cut wooden ornaments which are available at C. Hartman Designs under the Supplies Category and are gorgeous. These are brilliantly cut out and come ready for you to paint. Fabulous, quick and easy!!! 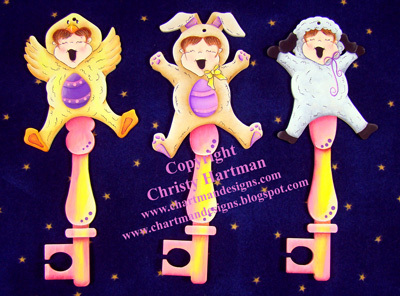 These three characters are jumping for joy over the Easter holiday and would be adorable painted on the ornaments or could very easily be adapted to a variety of surfaces. 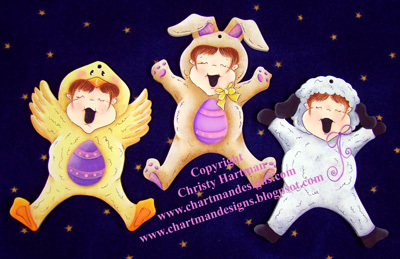 They have the most adorable personalities and hopefully will brighten your holiday decorating. The laser cut wood pieces for this pattern are available under the Supplies category in the Main Menu, unfortunately the surfaces are currently unavailable until the first of March. You are purchasing an E-Pattern and once payment has been received you will receive an email with instructions to download the pattern.